The Hierarchy of Development explains the difference between external motivation and internal motivation. Although technically all motivation is internal, being able to articulate something outside of ourselves that prompts or motivates will help us make more responsible decisions. Here is a quick review of the Hierarchy of Development. Keep in mind that it is the effect of the hierarchy—how people grow—that makes learning the levels (concepts) so valuable. Think of the hierarchy as rubric or reference for making decisions in life. The hierarchy has four levels (concepts). As with any hierarchy, the most advanced or highest level is placed at the top. NOTE: After the concepts have been taught, reference is made only to the LETTER. For example, the highest level is referred to as Level D.
The term “Democracy” is used because democracy and responsibility are inseparable. Motivation at this level brings the most satisfaction and is the major contributor to healthy self-esteem. A woman wrote me that when she left the food market and arrived at her car, she realized that she did not pay for the lime she was holding. No way did she want to walk back and pay the 10 cents. However, she knew the levels of the Hierarchy of Social Development and reflected on what was the right thing to do. She walked back to the nearest cashier and apologized for leaving the market without paying the 10 cents. The cashier thanked her, and the woman said that the feeling of satisfaction was so strong that she felt compelled to share it with me. We cooperate with others in order to live in a civilized society. Most of us live our lives at this level. Action at this level is often prompted by motivation to please others, receive a reward, or to avoid a negative consequence. 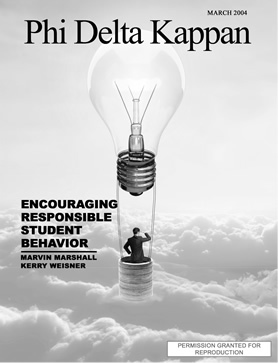 A danger exists at this level, however, when the young conform and comply to peer influence that may not be in society’s or in the person’s best interests. Example: a youth wants to belong to a group of peers who all smoke. What do you think the youth will do to be like and liked by the others? The youth will be prompted by external motivation—to conform to the others and will start smoking. 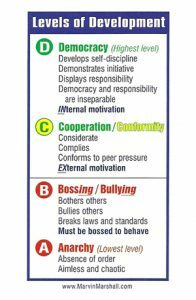 The difference between Level D and Level C is in the motivation—rather than in the behavior. Another example: A youngster is asked (Level C –external motivation) to pick up trash. However, if the person sees the trash and takes the initiative to pick it up WITHOUT BEING ASKED, the motivation would be Level D. The action of disposing the trash is identical in both C and D; the difference is in the motivation. NOTE: Level C is expected. Level D is voluntary. The objective is for young people to reflect on their motivation: EXternal vs. INternal. These two higher levels of MOTIVATION are BOTH acceptable and describe how most of us live our lives most of the time. This level is characterized by chaos, being out of control, or unsafe. Anarchy is the fundamental enemy of civilization. 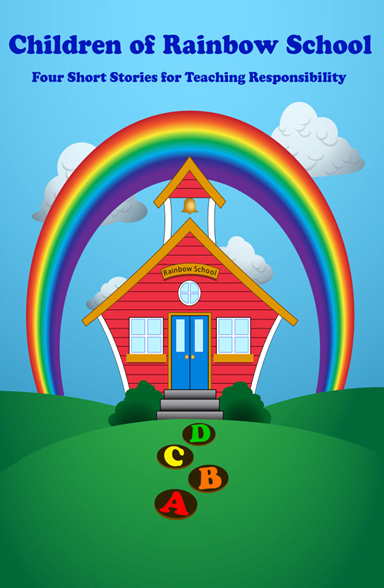 The stories and illustrations in Children of Rainbow School will give you greater understanding of these four concepts and the reason that Level D (internal motivation) is the most satisfying of all rewards—taking the initiative and doing what is right simply because it is the right thing to do. Tip: Share the Hierarchy of Social Development. Reflecting on the levels of social development is the most successful approach to changing behavior. The reasons are that the approach is (1) totally concoercive and (2) totally bypasses the natural desire to self-defend one’s behavior. 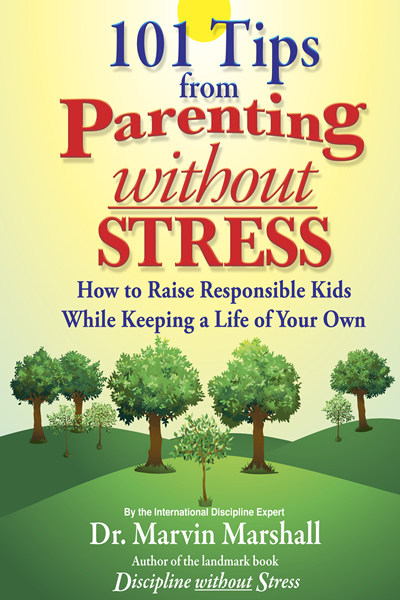 More insightful tips on how to manage stress and improve relationships are in my book, “Live Without Stress: How to Enjoy the Journey”—available in the WithoutStress.com Shop. 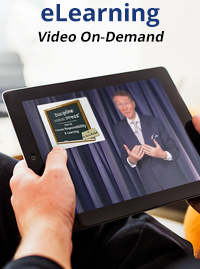 You will learn how to manage your mind, reduce your stress, and live longer.